Just click through to the site, please. It's hard to describe. Well done, TomCat. In a few hours we will learn whether or not the Koch's bought this election. People are out in large numbers to vote and I think it may be close, but do hope Wisconsin will find it's way out this mess. Walker and his gang of thugs are under investigation and may be nearing a grand jury indictment, so win or lose he just might find his next office has bunk-beds and metal bars. Still laughing after going to the site. Love the quote "Overcoming right wing insanity, one day at a time.".. The voting machines in his recall election are every so suspect of being able to flip votes to him and nothing has or will be done to change that before the election. No paper trail etc. Only way the Repubkes can win in elections appears to be by cheating/lying...the Bush elections proved that beyond all doubts in the world mind not just those of Americans. Kind of.makes one wonder what kind of people suport that party in the first place, but then most of us have a good idea of the types that do ... Amazing how proud they are to be liaers/cheaters and over all sleeze balls in their support ...what a mindset ! We can only hope! I'd like to think the union membership will turn out in record numbers! A butthead in a bowl! Time to flush that nasty stench. hahahaaa! thanks for the laughs Tom! Indeed, we will see how this is going to "go down" today. Its really been a wild ride with all we have been living through these past years. I hope that once he is gone, a new dialogue can be opened for cooperation and that whoever takes over will be a uniter not a divider as this Walker proudly touted as his agenda "we must divide then conquer..." Weren't those the Draconian words of all the evil rulers that ever came to power? I see a bad clog coming!!!! Awesome cartoon Tom, I do hope Walker gets flush tonight. The lines were long today here in Wisconsin. Went to the polls at 10:00 this morn and had to go back because the line was so long. Looks like Walker has a lead right now. It is 9:00 p.m. here (central time) so, I am anxiously waiting. I just saw an update with about 72% counted --- the Fartfuhrer 55%, Barrett 44%. There was also word that the Democrats looked like they took back the Senate but didn't hear anything of the Lt Gov race. Barrett has not yet conceded defeat. There was also a note that the DOJ is watching this carefully, but sorry, I don't put much stock in that. If this stands, it is indeed a very sad day for Wisconsinites. The Fartfuhrer really is in dire need of a swirley! Union members turned out in droves, but Walker still won. I feel sorry for the state of Wisconsin. The cost will be high for the people of Wisconsin. They just don't know it yet. With Kochroach money and his "smoke and mirrors" property tax cuts for the middle class, at the expense of local governments, schools and Unions and tax breaks for corporations he has managed to buy this election. The middle class that voted this political conman back in will ultimately pay more than they received, This win will make it that more urgent for the rest of us to make sure the TalibanTeaParty does not gain more control. So disgusted this morning to learn he actually kept his seat. Guess the people who voted for him don't realize they just voted against their own best interests. If this is a forwaring of Nov 2012, we are in deep do-do if the rethuglicans keep fooling the foolish which they are so good at doing. Thanks to all except John, and I'm pleased that many of you appreciated the humor. I won't comment on the election, because that is the subject of today's lead article from me. The people of Wisconsin didn't flush! How could that happen? Here in NY State, we would not only have flushed several times, but would have blown up the toilet to ensure that he'd never resurface. Let's face it, with all the financing he's received from the Koch brothers, he'd probably end up being a floater. 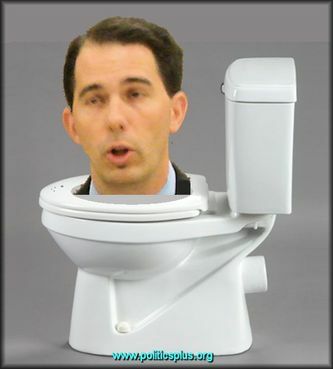 Sadly, many of the citizens of Wisconsin are absolutely "gloating" over Walker's win! After months of media-based brainwashing of the ill-advised, ill-informed and/or weak-minded, courtesy of the Koch brothers, it will probably take some time before they realize the consequences of their actions. I feel as though this is a bad dream. Oh how that was worth a thousand words of laughter. I did not on the site TomCat, lol. can't believe they didn't flush....how rude!!! !